OMG So some of you know, we don’t use too much oil anymore and we are definitely not margarine or egg white people. Ryan has been eating red meat, eggs with avocados and cottage cheese cooked in butter or bacon grease and is cutting down like a pro for an upcoming modelling gig. I am slowly but surely working towards the Rachel McLish body I want, and we are doing it FULL FAT. So imagine my level of joy when a friend online shared Fat Works…this wonderful company with beautifully jarred versions of real fat. While many find cooking with oils healthy…I don’t. Heated oil is actually not very healthy for you at all. Fat however, your body needs…cholesterol is so important to the body it actually produces it itself! Your brain is mostly made up of cholesterol (Hence the incredible correlation between the taking of statin drugs and this whole “lower my cholesterol” diet fad and the sharp rise in DEMENTIA and Alzheimers). Your brain NEEDS FAT. Now that you’ve been re-educated…let’s get back to FAT WORKS. We have switched over to cooking anything we used to cook in oil, or any dishes that required some oil, to doing so with pure animal fat or butter instead, depending on the dish. This great little company for all you happy fat cookers, offers premium Grass Fed Ghee, Duck Fat, Buffalo Tallow, Chicken Schmaltz, Chicken Fat, Goose Fat, Pure Lard, Leaf Lard, Pork Lard, Wild Boar Lard, Grass Fed Tallow, Lamb Tallow and blocks for those of you with a FRYER. THIS STUFF IS AMAZING! I am soooo excited to start cooking with some of these delicious jars of fat and post some recipes for you! In the meantime-if you want to try it with your own recipes check them out! I do receive a small commission To all my Youngevity people-I know you guys are going to be happy about this company so if you make any awesome recipes…DO SHARE with the rest of us!! 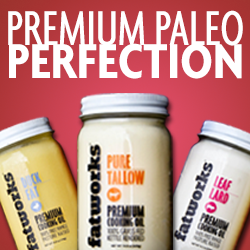 Click on the picture below or above to check out their website and order you some cooking fat! Thanks a lot for the posts.Really looking forward to read more. Fantastic.